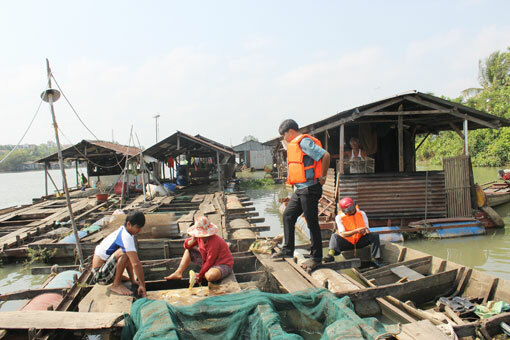 DONG NAI (VNS)— Bien Hoa City People's Committee in southern Dong Nai Province asked local agencies on Monday to carry out a planned relocation of households living in floating villages on the Dong Nai River as soon as possible. "The relocation project aims to tackle worsening pollution in the river, which causes fish to die en masse. It's a problem that has occurred on and off for years," said Deputy Chairman Pham Anh Dung. There are over 800 floating houses on the Dong Nai River, mostly in Thong Nhat, Tan Mai, Long Binh Tan and An Binh wards and Hiep Hoa Commune. Nearly half will be relocated under the project. As many as 126 of the 247 local households have agreed to implement the project, according to the latest report from the Economic Department of the city People's Committee. "Local households with floating rafts who refuse to implement the project will be forced to relocate by April," Dung said. Since local residents began breeding fish in floating rafts tens of years ago, they often died en masse due to untreated wastewater from millions of households and thousands of factories. The amount of organic substances, iron and bacteria in the river exceeds permitted levels, according to the province's Department of Natural Resources and Environment. The pollution was exacerbated by bags of poultry internal organs used as fish food and a rapid increase in the number of fish cages—there are up to 800, despite the limit of 200—which reduced the oxygen concentration in the water. Local authorities have tried to reduce the number of fish cages in the area for years. Yet the planned relocation has still not been implemented, although its deadline was the end of last August.